food safety｜Our company｜Marumatu bussan Co,Ltd. In order to ensure the quality of our products, which we import from overseas and distribute domestically, we abide by the Food Sanitation Act. When we import food items from overseas, Japan Ministry of Health, Labor and Welfare conducts examination of the products as well as the documents accompanying the products to ensure that the amount of additives or pesticide residues is within the regulated level. We acquire proper permit when we import items from overseas. And we always have in mind our belief – Food Comforts the Soul. We are constantly aiming to improve our system of production and import/export. Also, we established Quality Assurance Department under the direct management of the CEO. On top of abiding the regulations of the food industry, we aim to strengthen the system of our production. We also conduct food safety trainings in our factory overseas. Inside or outside Japan, we focus on our customers’ needs. We are always working towards ensuring food safety. Since a large portion of our products are imported from China, we regularly dispatch staff from our Quality Assurance Department and/or staff who are well informed of situations that take place in China to China monitor the production process. In order to control the production of our materials, we have created a set of internal quality management schedule to examine every process of our production. The managers in charge exchange information to achieve a mutual understanding and conduct trainings on how to achieve the best quality. We also periodically conduct food safety tests on factories and transportation providers that we work with. All factories that supply products sold by Marumatsu Bussan are sampled regularly. Pesticide residue test of raw materials is required before they are shipped out in order to ensure the safety of our products. The imported items are then sampled by appointed organizations when they arrive in Japan. After our products acquired permission to enter, our Quality Assurance Department conduct tests such as testing the level of bacteria to ensure the safety of our products. Since the Great East Japan Earthquake, which took place in 2011, there have been concerns regarding the possibility of nuclear contamination caused by the nuclear leakage. We have been conducting tests on water from Mount Zao since April 2011 to further ensure the safety of our products. 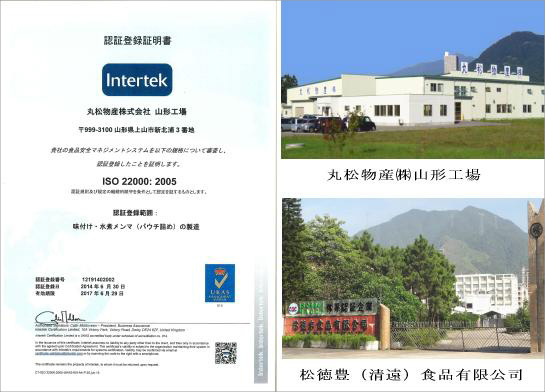 Our factories both inside and outside of Japan are certified by ISO, International Organization for Standardization. Marumatsu Bussan’s subsidiary company, Song De Feng（Qing Yuan）Food stuff Co., Ltd. , acquired ISO9001 in August 2002. And it has been certified by HACCP, the Hazard Analysis Critical Control Point system since 2008.Our Yamagata factory has been certified by ISO22000 and HACCP since June 2014. 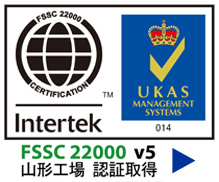 Although we have reached our goal to acquire certifications for all of our factories, we will continue to strive to research and to develop better and more products for our customers. We will continue our effort in maintaining the quality and safety of our products.